Girl in Hyacinth Blue is a 2000 novel by Susan Vreeland based upon a fictional painting by Vermeer. This imaginary painting links the eight unrelated stories together through centuries. The novel is constituted of eight chapters, each has a story; it initiates with the last owner of the painting till the girl of the painting herself. In other words, it follows the owners of Vermeer’s painting chronologically in reverse from the present day back to the mid-seventeenth century when it was painted. In an interview with Susan Vreeland in 2002, she discussed multiple facts concerning her novel Girl in Hyacinth Blue. First of all, Vreeland declares that her choice of Vermeer goes back to her fascination with his paintings. In fact, she was captivated in a reflective moment “by that gorgeous honey-colored light which also touched with significance the carefully chosen items in the scene, I found a healing tranquility.” She maintained that his paintings reminded her of Wordsworth’s line: “With an eye made quiet by the power of harmony and by the deep power of joy, we see into the life of things.” Furthermore, she has also seen such affinity between them: “I saw that Vermeer had the same reverence for hand-made things that I felt”. Indeed, Vermeer does not create a specific narrative in his works but rather concentrates on the moment itself and the rest of the story is created by the observer; that is what Vreeland focuses on in her novel. Each character in the story constitutes a subjective interpretation of the painting as well as a spiritual or physical relationship with it. Since the painting moves from owner to owner, it is often a source of solace and comfort, particularly to women who see themselves in the subject. However, it is also a source of material wealth and is often sold so that the owner can live a better life. In this way, Vreeland, presenting art as something with both physical and emotional value, illustrates the ways in which the two can often conflict. Thus, Girl in Hyacinth Blue represents one of the finest examples that correlate between the realms of literature and arts. In fact, the owners of the painting in the first and second stories have been valued spiritually by the painting. Although Cornelius is a mathematics teacher, he gained artistic skills; the painting also reminds Hannah of delightful memories; strengthens her relationship with her father and her aesthetic skills. Similarly, the last story shows the aesthetic and emotional values of the painting; Magdalena longs to be a painter like her father especially after having been painted and how the painting as one of her father’s has reminded her of her childhood. On the contrary, the rest of the stories show the clash between its practical and spiritual values ending up gaining from practically. In spite of Laurens’s possession with the painting as it reminds him of his first love, he gives it to his daughter to express love for her and loyalty to his wife. Claudine sells it in order to run away from her husband although she has always sees the girl in the painting as her own unborn daughter. Moreover, Saskia sells it to help her family financially despite the intimate connection between them and its aesthetic value. Adriaan has also left it along with his boy in a boat to be found and brought up financially through it; nevertheless it has a spiritual intense relationship with his dead wife. Finally, Vreel and shows the financial gain of the painting through Vermeer himself who has sold his painting, despite his affectionate relationship with it, to pay his debts. 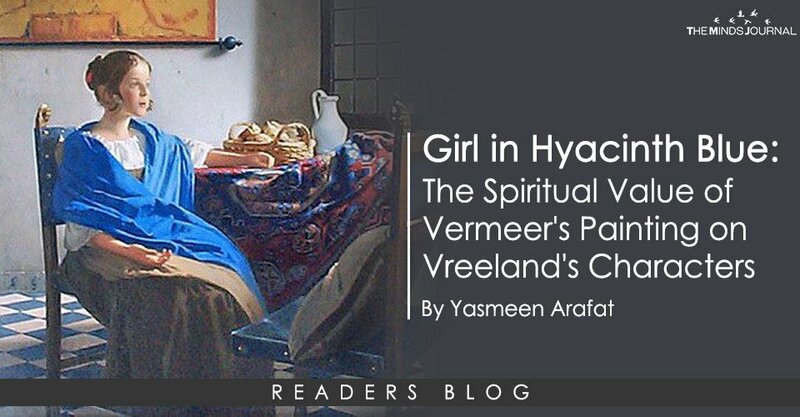 In short, these spiritual and physical relationships between Vreeland’s characters and Vermeer’s painting underscore the inter connectedness between literature and arts in a broader sense.